Don’t say cheese, Mr. Assange. Click for the original cover. The ideal style of portraiture for news magazines is something I like to call the mug portrait, or the subjective mugshot. A key difference between a daily newspaper and a weekly news magazine is that while the former sets a standard of timeliness and objectivity, the latter’s goals are topicality and ambivalence. This is a subtle distinction, no doubt, but a crucial one nonetheless. The newspaper aims to present events as they occur, whereas the news magazine presents the outcome and consequences of those events after they have occurred, aiming to study their mid- to long-term effects. As a result, the news magazine allows critical analysis in its coverage, without the need to make a clear-cut distinction between this editorial material and the hard facts. This journalistically subjective stance is as true of the words as it is of the photography that accompanies them. And this is where the mug portrait comes in. Some years ago, a certain OJ Simpson was in the United States media’s cross-hairs. At the time, much was made of the wildly contrasting depictions of Simpson on the covers of Newsweek and Time, the two leading news magazines back then. 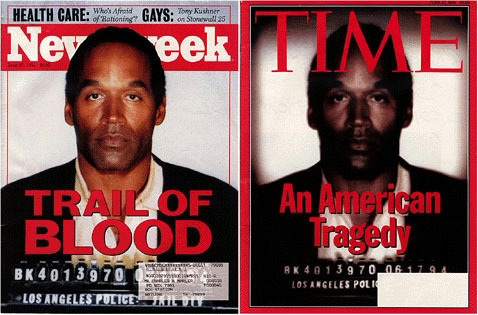 That happens often, of course, but what was interesting in this case was that both magazines used the same shot, specifically Simpson’s official mugshot, on their respective covers. 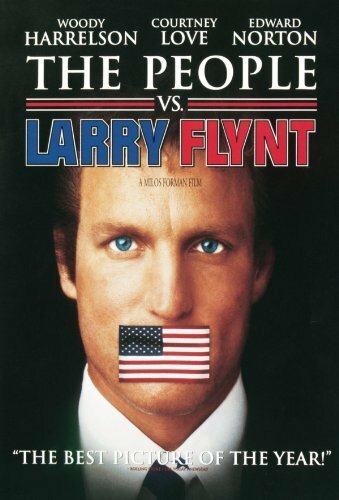 The result of printing it in an original unaltered form on one cover and of digitally manipulating it on the other, was that one magazine portrayed him as innocent (at least until proven guilty) while the other portrayed him as guilty beyond doubt. OJ Simpson vs. OJ Simpson. However, this time the creative license taken with the photograph is much more overt. 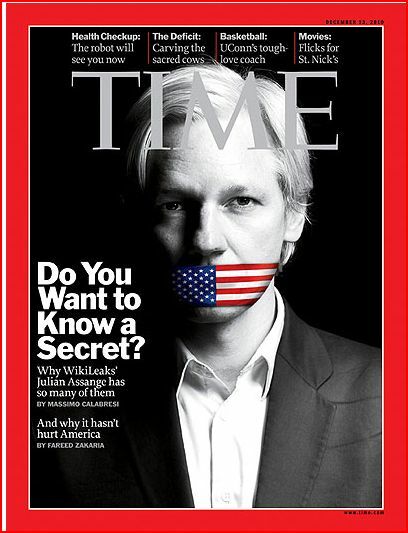 The shot presents Assange in tasteful black and white (somewhat characteristic of his elusively elegant style), his mouth bound with a full-color American flag. The image leaves very little doubt about its message, underscored by the accompanying title “Do You Want to Know a Secret?”. 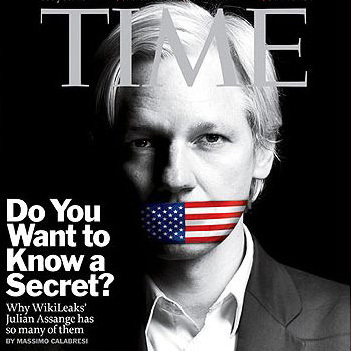 However, the other shoe drops in the smaller title, which reads “Why WikiLeaks’ Julian Assange has so many of them… And why it hasn’t hurt America”). Is this image groundbreaking? Perhaps not. Is it worth a thousand words? Perhaps not. But the stories leaked by Julian Assange apparently are. Right on Marshall! After seeing all the eeinvdce against these crooks I cannot believe how they get away with it. The us has been struggling with this for years. Mostly to do with the Fed and Wall Street. In Canada people are starting to wake up as well to the fraud & crime in high places. We are slowly being brainwashed into believing that our politicians are right on top of things and re there to protect and look after us. Bull! Just look at the police state tactics during the G20. Police provocateurs caught red handed in Quebec. Radiation detectors being turned off afterFukashima without reason . And this is just the tip of the iceberg that has been found out. Why is nothing being done to address this. I believe that still the majority of us are asleep and that is why nothing is being done.